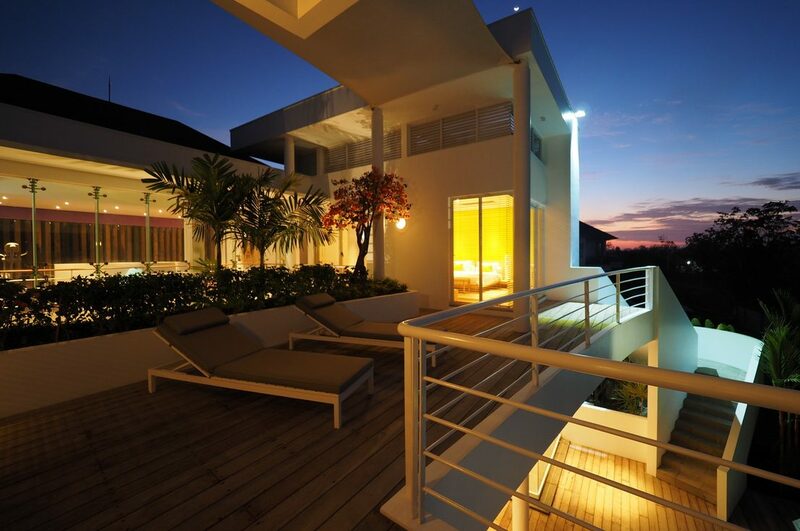 Located in the uphill of Pecatu area, Phocea Golf View Villa by Premier Hospitality Asia is a modern luxury villa offers 4 bedrooms with all fully equipped en-suite bathrooms featuring high European standard throughout the sleek bathrooms with free toiletries, hair dryer and bathtub. This spacious villa completed with outdoor Jacuzzi, swimming pool and bale pavilion with uninterrupted view of golf course. The villa has exquisite finishing, with contemporary design furniture, impressive seating area, lounge deck and a fully equipped kitchen, giving every guest the individual full privacy and coziness. Each bedroom completed with a comfortable bed, a flat screen TV with international channel, free internet access and nice view for a better quality of sleep. Phocea Golf View Villa is only 500 meters from Dreamland beach and Balangan beach. Its strategic location is in the middle of Pecatu Graha where New Kuta Golf is adjacent to the villa. Furthermore, El Kabron Cliff Club is 8 minutes away, Garuda Wisnu Kencana is 10 minutes away, Omnia Day Club is a 15 minutes’ drive from the villa and Uluwatu Temple is 20 minutes away. Options of Continental or Indonesian breakfast is available in the villa and our lovely and helpful staff will be ready to assist and accommodate your request, prior to arrival and during your stay in Phocea Golf View Villa. Main Living Area (Open-air living area, Television & DVD player, HiFi sound system). Bedroom 1 (Ensuite bathroom with bathtub, King size bed, Air-conditioning & ceiling fan, Television with DVD player, Sofa, Walk-in wardrobe, Wardrobe, Terrace outside bedroom). Bedroom 2 (Ensuite bathroom with bathtub, King size bed, Air-conditioning & ceiling fan, Television with DVD player, Sofa, Walk-in wardrobe, Wardrobe, Terrace outside bedroom). Kitchen and Dining (Semi open-air kitchen & dining area, Fully equipped kitchen, Cutlery, chinaware & glassware, Water Dispenser, Full-size refrigerator, Dishwasher). Services Performed by Staff (Maid, Housekeeper, Swimming Pool Attendant, Garden Attendant). Property Outlook (Swimming pool, Garden views). Swimming Pool Area (Private swimming pool, Bale’ (small Balinese gazebo) with ceiling fan, Poolside sunlounges with umbrellas). The name speaks for itself – from this peaceful site of this waterfront villa you can enjoy sunsets without ever having to leave your own swimming pool. The modern tropical architecture and minimalistic interiors provide no distraction from the breathtaking ocean views and the surrounding landscape making it an ideal place for a romantic getaway, a family vacation, or a fun Bali villa holiday with friends. Each of the three bedrooms has large changing room/bathroom with both indoor and outdoor traditional Balinese shower. Relax in the spa, sun tan by the pool, have a massage on the Bale or sit in the comfort of the outdoor lounge area – there is a place for everyone in Sunset Villa. 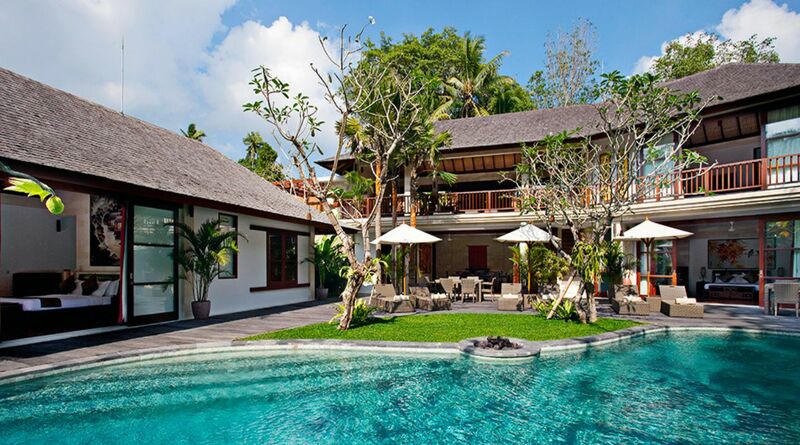 Villa Iskandar is a serene riverside sanctuary, built into the banks of the Yeh Penet River in Bali’s Tabanan Regency. Designed over three levels, this elegant villa comprises four air-conditioned bedrooms, a large free-form swimming pool and ironwood deck, an open-sided living room and a more formal dining room. A poolside dining area and a choice of balconies and decks provide endless options for relaxation. The property’s stunning contemporary architecture is harmonised with dark timbers and a Chinese-themed decor, completed with antique furnishings and artwork throughout. Against a gorgeous backdrop of towering trees and thickets of giant bamboo, guests will be serenaded by the song of the river and the sounds of nature. Here, iridescent blue kingfishers, monitor lizards and other creatures are commonplace. This peaceful out-of-town location feels like it is miles from anywhere but is actually only 13 kilometres from the restaurants, nightlife and shops of Petitenget and Seminyak. A car and driver is available for up to 8 hours a day (at a special rate), to whisk you off for a night on the town or for a visit at the picturesque Tanah Lot sea temple. Iskandar shares a dedicated 400-square-metre event space with its neighbour Villa Atacaya. 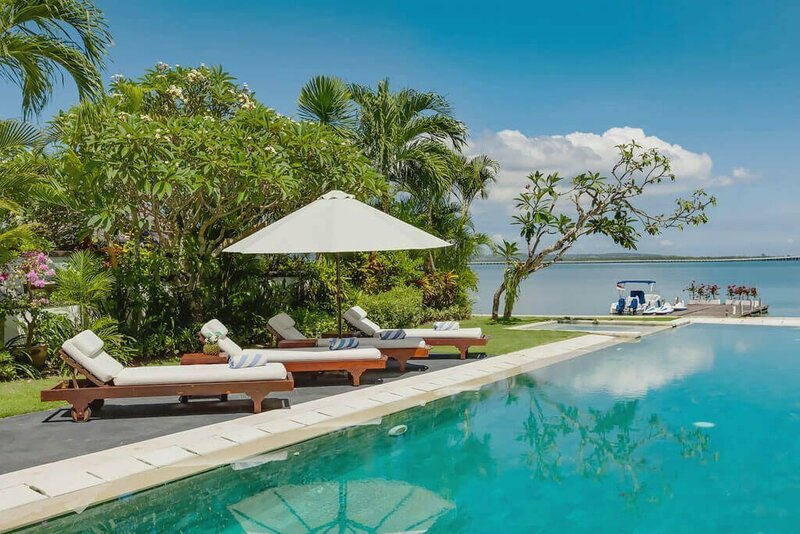 When the two villas – known collectively as the Nyanyi Riverside Villas – are rented together they offer a 9-bedroom option for large groups of friends, extended families and wedding parties. Complemented by sophisticated facilities, caring staff and superb service, Iskandar offers a truly beautiful setting for weddings and events, and is great for families and groups of friends who are looking for a luxurious close-to-nature escape. Poised on a cliff-top commanding stupendous views of the ocean, Sohamsa Ocean Estate comprises the five-bedroom Villa Soham and four-bedroom Villa Hamsa. The villas are set in an exclusive enclave on the southernmost part of the Bukit peninsula – a still-unspoilt slice of Bali that’s only half an hour from the airport and close to some of the island’s best known attractions – the iconic Uluwatu sea temple, for example, the seafood restaurants of Jimbaran Bay, and some world-famous surf breaks. Sohamsa Ocean Estate owes its name to a Sanskrit mantra: ‘Soham’ – and its inversion ‘ham-sa’ (translating as ‘I am he’) – suggests oneness with the universe. It’s an inspired name, as the villas’ magical setting sparks mindfulness and an appreciation of nature’s bounty. Within both beautifully designed villas are abundant living and dining spaces (both formal and casual, air-conditioned and alfresco), generous air-conditioned bedrooms and bathrooms, large infinity pools, and well-equipped gyms and massage rooms. After a hearty breakfast served on the dining terrace, spend your morning pushing weights in the gym, working up a sweat in the sauna and cooling off with a few laps in the pool. After a morning of activity, you’ll deserve a leisurely lunch in the poolside pavilion, and a siesta on the deck followed by a massage. Take your chauffeured car to Pandawa Beach for an afternoon swim or kayak, then sink into a deep relaxing bath with breathtaking ocean views, before adjourning to the pool pavilion for sunset cocktails and a seafood barbecue prepared by the highly accomplished chef – part of a ten-strong staff dedicated to making your time at Sohamsa really special. Bedroom 9 (Ensuite bathroom with bathtub, Air-conditioning & ceiling fan, Television with international channels & DVD player, Wardrobe with safety deposit box, Study desk).